sailboat. : Sunday Snapshots: Instagram Style 003. One. I was super lucky to receive two new perfumes as a late birthday present & I adore them both! I think that Stella is going to be my new signature scent and I can't believe that I haven't owned a bottle of this before! Two. Ralphie's new favourite thing is chewing on the corners of my bed sheets. Don't let that ridiculously adorable face fool you, he's such a cheeky bunny! He knows that biting these things is naughty but he'll do it anyway! Three. I had a huge fashion crisis and had to turn to twitter to tell me what to wear. I've been having too many of those 'argh I've got nothing suitable to wear' moments and I hate them! I'm now desperately trying to stock up on wardrobe basics in the hope of always being able to pull an outfit together in the future! Four. 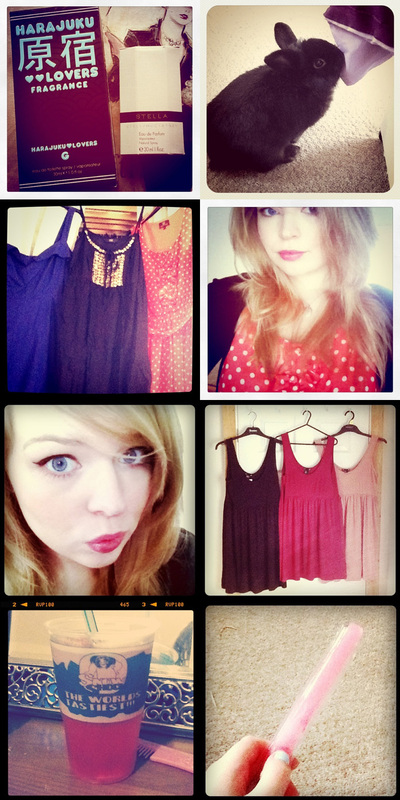 That particular day, my lovely red and white polka dot dress won! I accessorised it with sheer tights, simple flats from Primark & a black cardigan. Five. Black winged eye liner is fast becoming my go-to make up look and I'm really loving it! I've always envied girls that can pull off lots of eye liner because I've never been able to. My eyes are super small and end up looking even smaller, if that's even possible, when lined in black. A bit of winged liner on my top lid however seems to make my eyes look bigger and in my opinion, that's always a good thing! Six. I bought one of these basic vest top/tunics from H&M a couple of days ago and once I got it home and tried it on properly I immediately regretted not picking up other colours. Of course when I went to purchase some more on the H&M website (which is extraordinarily rubbish! ), they didn't have any - typical! Cue lots of complaining from me and desperate tweets asking if anyone knew of anything similar anywhere, but no such luck. Yesterday I braved the 40 minute bus journey to my closest H&M and kept my fingers crossed the whole way that they'd have some in stock and they did! Yay! I'm now a happy Jennie because these are SO flattering. I think it's the empire line cut and the fact that they're a lovely length. Is it me or are lots of things super duper short nowadays? I wish I had good legs! Seven. I discovered that a shop literally 20 seconds from my house sells bubblegum flavoured slushies and I'm in love! I know exactly where I'll be going when the weather gets really warm because these are just divine. Whoever thought up the idea of adding flavouring to crushed ice is a genius! Eight. Another love of mine is ice pops. I much prefer these to ice cream and they're so super cheap! The pink ones are my favourite, yummy! Have you had a good week? Got up to anything exciting? love these! I have the same problem, my eyes get like a million times smaller with eyeliner all round- I should try what you've done! craving an ice pop now. This post makes me excited for summer! Although, I thought the ice-pop was a pregnancy test! @candace - haha nope, definitely no sailor babies on the way! Bubble gum falvour slushies sound AMAZING! Wish somewhere near here sold them, I'd probably live off them. Heh heh, naughty Ralphie! He's such a cutie. @fern - it's super lovely and summery! @Emma - they're so perfect for just throwing on without having to think! @beauty's bad habit - I think I will be haha it's a good job they're fat free! @konni - he's super naughty! Hahaa we think along the same lines, more ice cream for me this summer! Ahhh Ice pops bring me back to my childhood haha! I love anything with an empire line, those vests look lovely! I love Slushies, I'm now wondering if I can buy my own slushie maker as bubblegum sounds amazing! You look beautiful in red polka dots. I'm loving this feature! You also look so so gorgeous with the eyeliner flicks. I'm very jealous! Ralphie is such a cutie-pie! Oh, and I'm sooo addicted to slushies, it's bad! Ralphie is such a darling, he looks so cute and fluffy! !